A quiet, stacked humbucker with an overwound, hot vintage sound. The Seymour Duncan STK-S7 Vintage Hot Stack Plus has a patented Stack Plus design with an overwound vintage tone, slightly hotter than the Classic Stack Plus. This revolutionary design injects tunable negative hum into the pickup circuit. Each stacked humbucker pickup is individually factory pre-tuned to offer the optimal traditional single-coil sound with no hum. The Vintage Hot Stack Plus is recommended for blues, rock, pop, and classic rock. Use in the bridge with a Classic Stack Plus middle and Vintage Hot Stack Plus neck for a punched up Strat tone, or in the neck with a Hot Stack Plus bridge for the ultimate rock Strat. Three-conductor cable allows splitting for true single-coil mode. 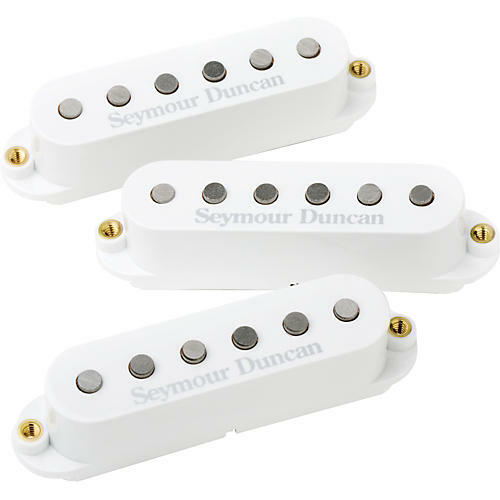 When three Stack Plus pickups are all split, the middle pickup is reverse-wound/reverse-polarity allowing hum-cancellation when used with the neck or bridge pickup. The Seymour Duncan Vintage Hot stack Plus is designed for all well-balanced instruments and works equally well with maple and rosewood fingerboards.